Thailand is famous for many things. The changing visa laws forces one to keep a breast of the latest developments and the requirements for a Thailand Visa . There are a number of options when it comes to Thai visas depending on what you want to do in Thailand. If you are coming to Thailand on holiday or just a short two week holiday then you don’t need a visa as you will receive a visa on arrival at the airport which gives you 30 days stay in Thailand. If you are crossing by land border then you will only get 15 day visa on arrival . Those are the current changes to visa on arrival status. This VOA applies only to certain countries and if you are not from a country which gets a visa on arrival then you have to apply for a Thai Visa before coming to Thailand. If you are looking at staying in Thailand for longer than 30 days it would be best to get a Thai Tourist Visa . We can apply for this visa on your behalf online . The Tourist Visa does not allow you to work and is valid for 60 days after arriving in Thailand. This visa can be extended at Thai Immigration for a further 30 days for the cost of 1,900 Baht. If you are coming to Thailand on business or to work then you need a Thai Business Visa . This visa is valid for 3 months as a single entry visa which gives you time to apply for a work permit . Once you obtain a work permit in Thailand, the business visa will be extended to expire at the same time as your work permit. If you are married to a Thai national or are looking at retiring in Thailand, you would need to apply for a Thai non-immigrant visa. The Thai marriage visa is known as the “O” visa and the Thai retirement Visa is known as the “AO” visa. Check with our consultants online how to apply for these as the retirement visa has conditions attached to it with regards to your age and financial status. The Thai marriage visa only has implications when it needs to be extended at Thai Immigration later. 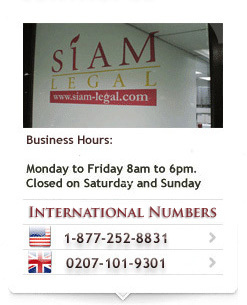 Speak to us at Siam Legal as we would be more than happy to show you how to have a hassle free journey to Thailand!